Early years: William A. Hamilton was raised in southwestern Oklahoma where he says his only pet was a tumbleweed and it blew away. Shortly after being elected Governor of Oklahoma Boys’ State, he entered the University of Oklahoma on Regent’s and Danforth Scholarships where, in combination with law school, he completed the requirements for a degree in Government. But he claims his main interests were campus politics and Army R.O.T.C. As evidence of that, he was named a Big Man on Campus (B.M.O.C.) in both his junior and senior years and was commissioned as an infantry officer. A member of Delta Upsilon fraternity, he finished his last year at O.U. as president of the Inter-fraternity Council. In 2002, during the 75th anniversary celebration of Delta Upsilon on the O.U. campus, he and fellow member, Ben Walkingstick, were named the two most outstanding alumni of the preceding 75 years. During his military service, he earned the following awards: the Silver Star, Legion of Merit, Distinguished Flying Cross, Bronze Stars (4), Purple Heart, Air Medals (20), Army Commendation Medal with "V," U.S. Air Force Commendation Medal, Expert Infantry Badge, Combat Infantry Badge, and Master Parachutist Badge. In 2008, he was named to the University of Oklahoma Army R.O.T.C. Wall of Fame. In 2018, he was made a laureate of the Oklahoma Military Hall of Fame. Public service: Following his military career, Dr. Hamilton held several posts in government and politics. In order: he was aide and speech writer for Nebraska Governor Charles Thone, deputy director of the Policy Research Office; director, of the Governor's Task Force for Government Improvement, and executive director of the Nebraska Republican Party. The governor who followed Charles Thone in office summoned the chairman of the Government Improvement Task Force and Dr. Hamilton to the Governor's Mansion to tell them that he was adopting their report as the blueprint for his time in office as well. Business: In 1983, Dr. Hamilton was invited to leave his adjunct professorship at Nebraska Wesleyan University and go to Wall Street to serve as the principal assistant to the head of the Public Finance Group for one of the nation's largest investment banking firms. While in New York City, he re-wrote the firm's complex publications on its various offerings, making them understandable to the lay reader. After that assignment, in 1984, he returned to Lincoln, Nebraska, where he and his wife co-founded Advanced Research Institute (ARI) an advertising, public-relations, and political-consulting firm which, after only one year in business, was recognized by the Lincoln Independent Business Association (LIBA) with its Gambler Award. Among a large number of state and congressional-level political-campaign successes, ARI played a key role in the election of Kay A. Orr, Nebraska's first-ever woman governor. Aviation: An aviator since 1968, he became active, after military retirement, in a number of civilian aviation organizations. 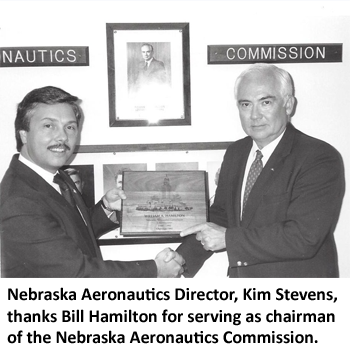 He served as chairman of the Nebraska Aeronautics Commission; chairman, of the Nebraska State Airline Commission, as a member of the Kansas State Aviation Advisory Board, as a member of the Colorado Aeronautical Board, and as president of the Friends of the Granby Airport, Inc. In 2012, the North Dakota Aeronautics Commission honored him with its first-ever Outstanding Service Award. He and his wife, Penny, co-hold a World Aviation Speed Record. In 2008, Dr. Hamilton was inducted into the Colorado Aviation Hall of Fame. In 2017, he was inducted into the Nebraska Aviation Hall of Fame. Journalism: In 1982, he created "'Central View," his nationally syndicated newspaper column, for SUN Newspapers of Lincoln, Nebraska. Later, in 1987, while serving as editor-in-chief of The Capital Times of Lincoln Nebraska, he became a featured commentator for USA Today. Dr. Hamilton is a winner of the Valley Forge Freedoms Foundation Medal for his writings on foreign and military affairs. He and his wife have co-authored a four-novel series of espionage novels: The Grand Conspiracy, The Panama Conspiracy, The Berlin Conspiracy and JFK: The Umbrella Conspiracy. They write as: William Penn. The largely autobiographical novels are based, in part, on his own experience as an intelligence officer in Europe. See: www.buckanddolly.com. For "Central View," see also: www.central-view.com. Dr. Hamilton is the author of The Wit and Wisdom of William Hamilton: The Sage of Sheepdog Hill, Pegasus Imprimis Press (2017) which is available via Amazon.com. "The late, great Reed Irvine, the founder of Accuracy-in-Media, was a friend and mentor," said Dr. Hamilton. "Reed and I traveled to the USSR and to South Korea together. Reed was always preaching accuracy above all. He made us all better at our craft. I am also indebted to Sid Hurlburt, my long-time editor at USA Today, who so generously gave me dozens of opportunities to oppose the editorial positions taken by USA Today. 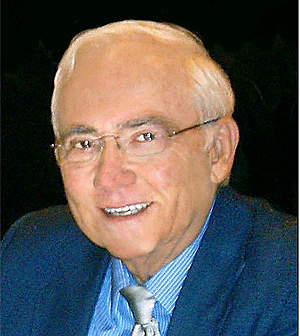 In 2014, Dr. Hamilton was inducted into the Oklahoma Journalism Hall of Fame. "To be in the same Hall with Will Rogers, Paul Harvey, Franck McGee, James J. Kilpatrick, Douglas Edwards, Bruce Palmer, John Cronley, and E.K. Gaylord, and so many other outstanding Oklahoma journalists is, indeed, an honor," said Dr. Hamilton. Academe: Over the years, Dr. Hamilton taught 300-level courses for the University of Maryland -- European Division (Fulda, W. Germany campus), Columbia College (Lincoln campus), and Nebraska Wesleyan University -- Lincoln. In 2015, Dr. Hamilton received the University of Nebraska Distinguished Alumni Award. Education: University of Oklahoma, B.A. (Government); U.S. Army Language School (German), The George Washington University, M.S. (International Affairs); U.S. Naval War College (Distinguished Graduate); University of Nebraska, Ph.D.(History), and Harvard Kennedy School of Government (Senior Executives Program). Current Hobbies: Downhill skiing, Instrument-rated pilot, sailing instructor, photography, painting, cowboy poetry, archery, canine rescue, and a classic XJ8L Jaguar sedan. Memberships: Association of Former Intelligence Officers, Jaguar Club of North America, Rocky Mountain Jaguar Club, Grand County Historical Association, the Colorado Pilots Association, the Colorado Aviation Historical Society, the Clan Hamilton Society, EAA Chapter 1267, AOPA, the Civil Air Patrol, the Patriot Guard Riders, the NRA, the Military Writers Society of America, the Greater Granby Chamber of Commerce, and Friends of the Granby Airport, Inc. He is a former member of the AOPA Lawyer-Pilots Bar Association. He is a life member of the Military Officers of America and a life member of the Military Order of the Purple Heart. Dr. William Hamilton claims to be a charter member of the Denis Thatcher Society, which is reserved for men who are married to women who are smarter than they are. His wife, Penny, the other Dr. Hamilton, has more degrees than a thermometer. She has been named: Grand County Realtor of the Year received the Colorado Realtors Association "Good Neighbor Award," and the Greater Granby Area Chamber of Commerce "Lifetime Achievement Award." She is a Denver Channel 7 "Everyday Hero," and is a 2011 laureate of the Colorado Aviation Hall of Fame. In 2012 she was awarded the National Aviation Journalism Award by the National Association of State Aviation Officials. In 2013, the Columbia College Alumni Association selected her for its 2013 Distinguished Alumni Award. A two-time breast-cancer survivor, one of her paintings was chosen in 2013 by the Eli Lilly Corporation to be enlarged as a mural and painted on a huge wall near Eli Lilly headquarters in downtown Indianapolis. In 2014, Penny was named to the Colorado Women's Hall of Fame. See: www.pennyhamilton.com. In 2015, Dr. Hamilton, along with her husband, received the University of Nebraska Distinguished Alumni Award. As part of their TV series on "Great Colorado Women," on February 15, 2018, the Colorado Women's Hall of Fame and Rocky Mountain PBS-TV, ran a 30-minute video about her life called: "Penny the Pilot" That program can be seen in its entirely on vimeo here. The other Dr. Hamilton just published The Wit and Wisdom of William Hamilton: The Sage of Sheepdog Hill, Pegasus Imprimis Press, (2017). Available via Amazon.com and selected retail outlets in Grand County, CO.